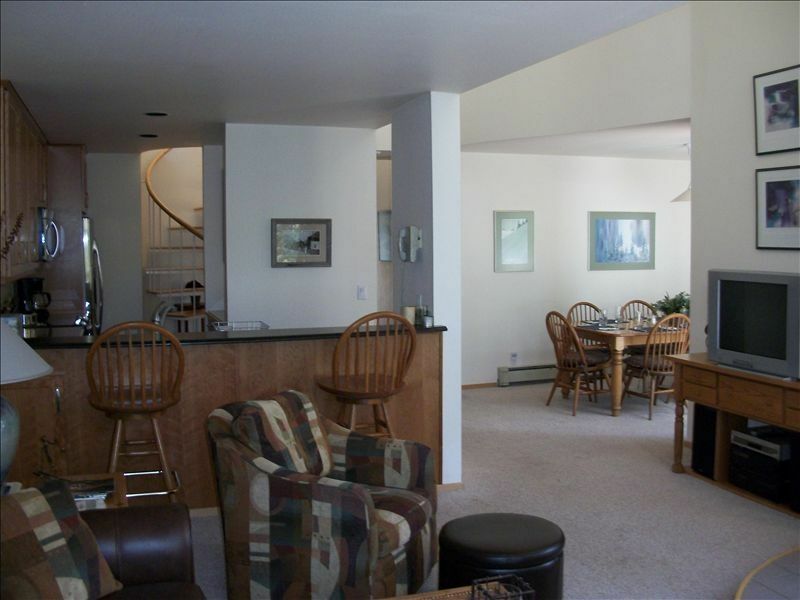 2 BR + Loft, Sleeps 6, Guest Favorite in the Heart of Frisco, Walk to Main St.
River Glen Condos are located in the historic mountain town of Frisco, Colorado, in the heart of Summit County. Copper Mountain, Breckenridge, Keystone, Arapahoe Basin, Loveland and Vail/Beaver Creek are all only a short drive away. This beautiful mountain home overlooks the Ten Mile Creek and is within easy walking distance to old Main Street where you'll find plenty of shopping and many fine restaurants to choose from. And, you are within one block of the 'Summit Stage', the free county wide transportation that will easily get you to the slopes, the Frisco Nordic Center and throughout Summit County. This spacious condo has an open ceiling Living area, with many windows looking at the Creek and the Pine Groves. The Master Bedroom has a Queen bed, Full Private bath, television and phone. The second Bedroom has a Double bed, with separate bath down the hall. The large Private Loft bedroom is accessed by a spiral staircase and features a Queen bed with an oversized 3/4 Bathroom that has double showerheads in the shower stall. There is also a Queen Size Sleeper Sofa in the Living Room. This condo is Fully Equipped! Please note: if the dates you want are blocked out on our availability calendar, please send us an email. We have two other properties in the same complex with the same floor plan. This is a NO Smoking, No Pets, Shoes off at the door home! Lynn and Todd. Awesome place and awesome location. Obviously since I have stayed at this location multiple times over the years. Love the comfortable accomodations. Can't say enough goog things about this unit. If one is looking for a three-six person unit, this is it. I look forward to the next opportunity. But I do have to say a few words about VRBO, and thus the lower star to draw people's attention..
After being an early adopter and using VRBO for over fifteen years, you can only imagine my DISAPPOINTMENT when I booked your rental and a service fee (SOMETHING I RECOGNIZE YOU HAVE NO COTROL OVER) was added to the entire charge. I hope VRBO treads carefully here. Nonbody seem to remember MySpace but everyone has a Facebook page. I imagine a future conversation of "Whatever hapened to that VRBO site", replied by "I don't know but I justed booke Lynn's condo from Googe Rentals and were are set to go"
The condo was perfect for the 6 of us and we'll equipped. The Location to town, shops and resturaunts was only one block. The summit stage bus stop was Also one block so you didn't have to lug the ski equipment far. My husband and I enjoyed our 6 week stay in Frisco. The location is great, right off Main Street which was very convenient for restaurants, shopping and accessing hiking trails. The condo was well equipped for all of our needs. We come to Frisco frequently in the summers and would definitely rent this condo again. My 2 friends and I head to Colorado for a ski trip every year. If we ever stay in Frisco again, we'll definitely try to book this place. The condo was clean and ready for us when we arrived. We each had our own rooms and bathrooms. The wood-burning stove started right up. All the kitchen utensils were available and ready to go. The use of the garage was great (for both our car and our skis). The big plus for us was the 1/2 block walk to the Summit Shuttle stop. (So was the ski rental shop, and all the Frisco restaurants.) Once we parked the car, we didn't get it back out again until we left. Cleaning fee of $120 per stay will be added. Cleaning fee = $150 for stays two weeks or longer.